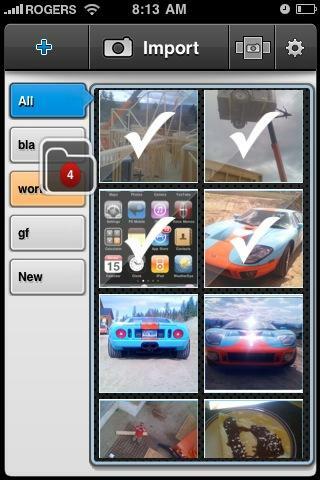 Pic-Safe is a photo organizing application, developed by Cal Stach. As the name implies, this iPhone app’s main feature is privacy. Other than added security, this app is pretty much the same as your photo library in your iPhone. To make a new album, you can import pictures from you camera roll, or take a picture. After you have organized your pictures, you can email them. As you create folders, you can choose to use the password protection feature. When I was setting this option up, I didn’t select a folder and just selected the privacy feature, and a pop-up appeared that saying, “Please enter nname of folder.” Please make sure you spell check anything that you are using in your app. After you have set up a password for a specific folder, each time you open it, you’ll be asked to type in your password. The icon for setting up a password is a little strange, it’s an adding symbol located at the top, left-hand corner of the screen. I’m not sure why its symbol isn’t anything but a lock or a key. Also at the top of the screen is an import option. In this section you’ll see different sources on your phone to import your photos from. Next to the import option you have a button that allows you to view all of your pictures, screen-sized. To browse through your photos just drag your finger across the screen as you would in your photo library. Lastly, there is a settings area. In this section you can edit the name of a folder, turn the password protection on or off, or erase the folder completely. The main feature of this app, the password protection is great. However, the layout of the app is a bit confusing. It seems like all of the options are just shoved into the app, with no consideration of how well they would all work together. I don’t really like the layout, and although the small buttons at the top of the screen leave more room to see your the thumbnails of you photos, it’d be nice if they were bigger, or at least have the pictures on the button represent what function they perform. AppSafari review of PIC-SAFE was written by Amanda McFarland on May 21st, 2010 and categorized under App Store, Photos, Utilities. Page viewed 4094 times, 4 so far today. Need help on using these apps? Please read the Help Page.